Are the proposed SB 375 targets ambitious enough to achieve California’s goals? 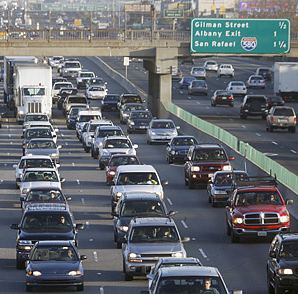 Interstate 80 in Berkeley. Courtesy of Time. The State Air Resources Board (ARB) has now proposed regional targets for California’s eighteen metropolitan planning organizations (MPOs), and Senate Bill 375 requires that the Board adopt the final targets by September 30, 2010. As previously discussed, the proposed targets are the product of a “bottom-up” approach, in which ARB has relied heavily on technical analysis carried out by the MPOs — especially California’s four large urban MPOs. But are these proposed regional targets — suggested by MPOs and, for the most part, endorsed by ARB staff — sufficient to achieve the desired reduction in transportation sector emissions? These targets are sometimes termed “ambitious” by ARB and the MPOs. However, some additional analysis suggests that these so-called “ambitious” targets may actually be too restrained to achieve California’s climate change goals. First, there is the matter of the Scoping Plan for Assembly Bill 32. Reform of regional planning (to be implemented through SB 375) was included among the numerous and diverse emission reduction strategies described in the Scoping Plan. Smarter land use practices would lead to a reduction in vehicle miles traveled (VMT), so this strategy was assigned an estimate placeholder of 5 MMTCO2E (million metric tons of carbon dioxide equivalent). The regional targets proposed by ARB staff would, however, achieve only a 3.4 MMTCO2E reduction by 2020. On the surface, then, the targets appear to fall short. But ARB has indicated, albeit without further explanation, that this 3.4 MMTCO2E reduction is actually sufficient under the most recent forecast for emissions in 2020. Before coming to a conclusion on the land use placeholder, let’s take a step back and examine transportation emissions generally. Courtesy of Center for Clean Air Policy. It is necessary to consider all three strategies at once, rather than individually — because even if one strategy falls short of the Scoping Plan’s reduction estimate, it is possible that other strategies could pick up the slack. Thus, when evaluating whether the proposed SB 375 targets will be effective, we should look to see whether SB 375 + LCFS + Pavley will together realize California’s emission reduction goals on different timescales. Note: A few calculations are necessary at this point, and if you would rather not read through number-crunching, you may want to skip ahead to the “Conclusion” heading below. 2020 Population projected to increase 18.8% above 2005. 2035 Population projected to increase 36% above 2005. To conclude, we compare these estimated reductions to California’s goals under AB 32. AB 32 requires that California reduce its emissions to 1990 levels by the year 2020. In 1990, emissions statewide were roughly 12% below 2005 levels. Thus, if SB 375 + LCFS + Pavley combined can realize at least a 12% reduction from 2005 levels, then AB 32’s mandate is satisfied (with respect to transportation sector emissions). The above calculation suggests that in 2020, these three strategies achieve a combined reduction of 19%. Thus, it appears that despite the Scoping Plan discrepancy we noted earlier, ARB’s 2020 target (when implemented alongside LCFS and Pavley) does meet AB 32 requirements. The year 2035 is a different story. Governor Schwarzenegger’s Executive Order S-3-05 provides that by the year 2050, emissions should be 80% below 1990 levels. Emissions need not fall off linearly, and it’s certainly possible to construct a model in which greater reductions are achieved in later years than in earlier years. If, however, we make the simplifying assumption that emissions reduction between 2020 and 2050 will follow a linear pattern, then emissions in 2035 should be roughly 40% below 1990 levels, or 47% below 2005 levels. Glancing above, though, we see that the combined reduction in 2035 is only 27%. Thus, in 2035, these rough calculations suggest that we will fall short — which implies that the proposed SB 375 target for reduced driving in 2035 is inadequate to meet the state’s climate change goals, and that a more aggressive target is needed to compensate for population increase. But if ARB’s regional targets for 2035 won’t do the job, then what is good enough? By how much do we need to reduce driving in California? More on that question in the next post.